In May 2016, the Provincial Government approved amendments to the Pharmacy Operations and Drug Scheduling Act. These changes permit the College to know the identity of all pharmacy owners, determine their suitability for pharmacy ownership and hold them accountable for providing safe and effective care by ensuring their pharmacies are compliant with legislative requirements for pharmacies in BC. The College drafted amendments to the Pharmacy Operations and Drug Scheduling Act Bylaws and forms to incorporate the new pharmacy ownership requirements. The bylaws were posted for public comment between June and September 2017 and have been approved by the College Board for Filing with the Ministry of Health. The new requirements came into effect on April 1, 2018. Renewals due on June 30, 2018 will be the first group of renewals to complete the new requirements and will be able to begin to do so on April 16, 2018 (75 days prior to renewal date). Review the Pharmacy Operations and Drug Scheduling Act Bylaws which incorporate the new pharmacy ownership requirements. The New Pharmacy Ownership Requirements ReadLinks Series features more in-depth detail on key areas of the new requirements for pharmacy licensure and renewals to help pharmacies prepare to meet the new requirements. Please have a look at these topical articles to support you in the processes to meet the new requirements. The new series of eServices tutorial videos feature step-by-step instructions to guide you through completing the new pharmacy ownership requirements on the College's eServices Web Portal. Feedback was important to help inform the College’s approach to operationalizing the new pharmacy ownership requirements. The College reached out to pharmacy owners and managers through workshops, discussions, and an online survey, to seek feedback on the new pharmacy licensing bylaws. Consultation focused solely on the application of the changes to the College’s pharmacy licensure process as the new pharmacy ownership requirements have already been set by the Provincial Government. 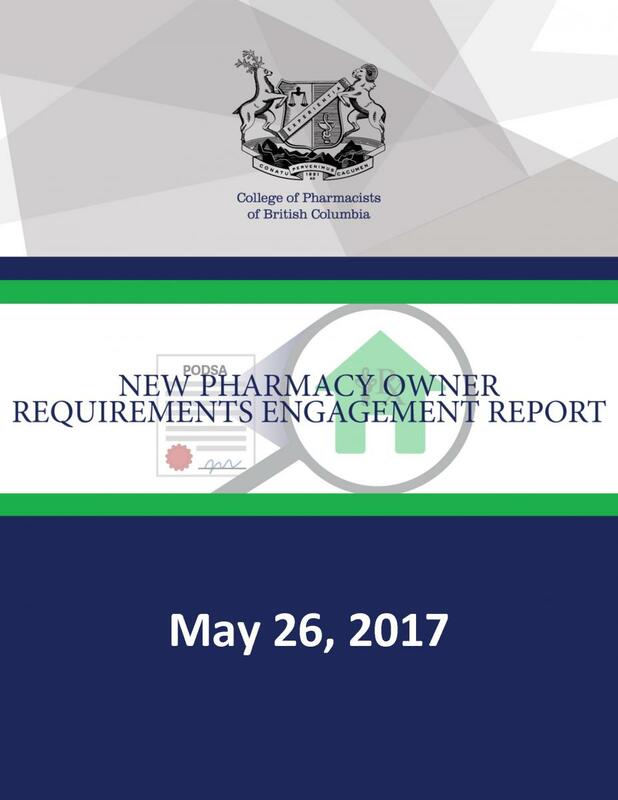 All the feedback received during the College’s consultation period is summarized in the New Pharmacy Ownership Engagement Report. The feedback received was very helpful and informed the development of operational processes and IT enhancements needed to support the new requirements. For example, feedback from owners of multiple pharmacies suggested including the ability to submit eligibility information at one time, rather than waiting for each pharmacy renewal date. The College also used feedback from the engagement to help inform the bylaws. A key example of this is regarding the roles and responsibilities of direct and indirect owners. These responsibilities were adjusted based on the feedback provided to be more proportionate to the level of control/involvement they have in the day to day operations of a pharmacy. Feedback also included concerns about the new Criminal Record History process. Participants indicated they were not sure which type of charges or convictions are covered under Canada’s Criminal Code. While it is not possible to include an exact list of charges and convictions within the bylaws, the College is working to provide further clarification and education around which type of charges or convictions are covered under Canada’s Criminal Code through an informational guide and other resources. 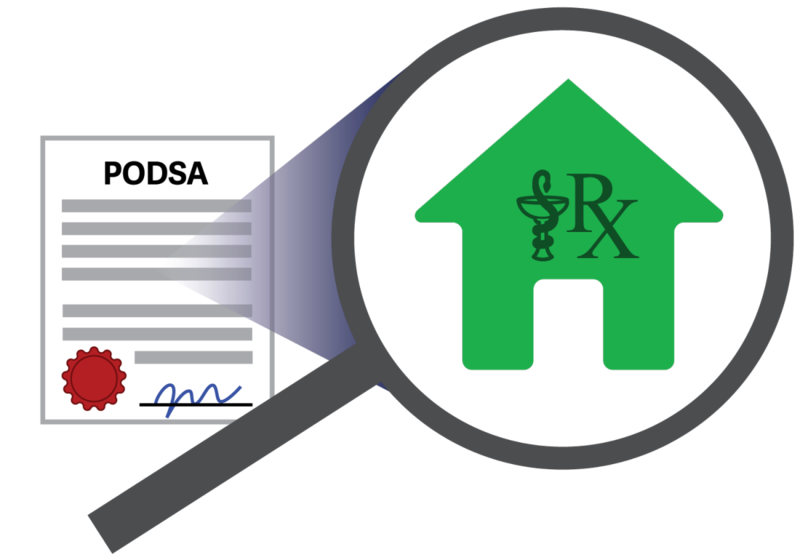 The new pharmacy ownership requirements were developed and approved by the Provincial Government as amendments to the Pharmacy Operations and Drug Scheduling Act. These requirements cannot be changed by the College, instead our bylaws operationalize the requirements as part of the pharmacy licensing process. Review the approved Pharmacy Operations and Drug Scheduling Act, or see the explanatory notes for Bill 6 which summarize the changes to the Act. Distinguishes between "direct owners" and "indirect owners"
Broadens the meaning of "pharmacy" and "pharmacy licence"
expands the meaning of "pharmacy" and "pharmacy licence". removes from the registrar's or application committee's consideration matters that will be addressed in the bylaws. is consequential to the enactment of section 7.1 of the Act by this Bill. adds requirements for direct owners, indirect owners and managers to provide criminal record histories. is consequential to the amendments made to section 1 of the Act by this Bill. requires direct owners, indirect owners and managers to give notice to the registrar if certain events occur. is consequential to the amendments made to section 1 and the enactment of section 3 of the Act by this Bill. is consequential to the repeal and replacement of sections 2 to 4 and the enactment of sections 4.1, 5.1 and 7.1 of the Act by this Bill. adds regulation-making powers consequential to the repeal and replacement of section 5 (1) and the enactment of section 7.1 of the Act by this Bill. applies new application requirements to applications for pharmacy licences received before the amendments to the Pharmacy Operations and Drug Scheduling Act made by this Bill come into force. removes a reference to a repealed provision. The Pharmacy Operations and Drug Scheduling Act define the types of pharmacy ownership allowed in BC. In particular, the the Pharmacy Operations and Drug Scheduling Act distinguish between direct owners and indirect owners. The type of ownership of your pharmacy determines what information is required as part of the pharmacy licensing process. While there are different types of ownership, the majority of pharmacies will fall under the “corporation” type of ownership. It is important for owners to be able to identify their ownership type to ensure they meet the requirements for renewing their pharmacy licence or opening a new pharmacy. 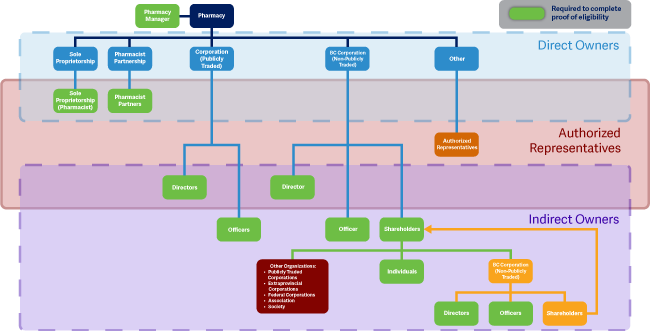 In accordance with the Pharmacy Operations and Drug Scheduling Act, assess your pharmacy’s ownership model using the Types of Pharmacy Ownership flow chart. Note: Shareholders of a corporation that is traded publicly, that are not officers or directors, are not considered indirect owners. Authorized representatives are individuals who are permitted to represent the pharmacy’s direct owner in the collection and submission of any and all information required to complete both the pharmacy licence application and renewal processes. They are also responsible for reporting any changes to a pharmacy’s licensure information to the College. Authorized representatives are determined based on their relationship with the direct owner of the pharmacy. Learn more about authorized representatives in this ReadLinks article: Who are the Authorized Representatives for Your Pharmacy?. Learn more about pharmacy ownership structures and requirements for licensure in this ReadLinks article. The new pharmacy ownership requirements specifically state that direct owners, indirect owners and managers must comply with duties imposed under the Pharmacy Operations and Drug Scheduling Act and Health Professions Act. Managers will continue to be required to actively participate in the day-to-day management of the pharmacy. Shareholders must meet the eligibility criteria for pharmacy ownership. Responsibilities will also include cooperating with College inspectors acting under the Pharmacy Operations and Drug Scheduling Act or Health Professions Act, and notifying the College of a change of name, address, telephone number, electronic mail address or any other information previously provided. Learn more about responsibilities of managers and owners within the new ownership requirements in this ReadLinks article. make arrangements for emergency access to the pharmacy’s hard copy patient records. notify the registrar of any change of telephone number, fax number, electronic mail address or any other information previously provided to the registrar. (3) Subsection (2)(p) does not apply to a hospital pharmacy, hospital pharmacy satellite or a pharmacy education site. (4) For the purpose of subsection (2)(t), a pharmacy closure includes a suspension of the pharmacy licence for a period greater than 30 days, unless otherwise directed by the registrar. accepting payment for a drug or device by a credit or debit card that is linked to an incentive. (6) Subsection (2)(aa) does not apply in respect of a Schedule III drug or an unscheduled drug, unless the drug has been prescribed by a practitioner. (7) A pharmacy education site’s manager must ensure that only registrants and instructors are present in the pharmacy education site and must also comply with subsections (2)(a), (d), (h), (o), (r) and (t)(i) and (ii). in the event of a pharmacy closure under subsection 2(t), notify the registrar in writing at least thirty days before the effective date of proposed closure in Form 4. (9) Shareholders must comply with subsections 2(d) and 8(c). The new pharmacy ownership requirements establish clear eligibility criteria for direct owners to be eligible to hold a pharmacy licence. The eligibility requirements set in the Pharmacy Operations and Drug Scheduling Act allow the College to better protect the public by determining the suitability of a manager or owner. Managers and owners need to meet the eligibility criteria in the Act, in addition to requirements under the College’s bylaws for a pharmacy to be licenced by the College. no direct owner, indirect owner or manager has, within the previous 6 years, had limits or conditions imposed on his or her practice of pharmacy as a result of disciplinary action taken by a body referred to in paragraph (h). Where an application for a pharmacy licence does not meet the eligibility criteria in the Pharmacy Operations and Drug Scheduling Act and the requirements in the College's bylaws, the Registrar must refer the application to the Application Committee. The new pharmacy ownership requirements require the Criminal Record History for direct owners, indirect owners and managers as part of the pharmacy licensing process. To meet the new requirements under the Act, all direct and indirect owners (see Types of Pharmacy Ownership) and the manager of a pharmacy must provide a Criminal Record History to the College every five years as part of the pharmacy licence renewal process. This is also required as part of a new pharmacy application process. In the case of a Hospital Pharmacy Licence and Pharmacy Education Site Licence, only the manager will be required to provide a Criminal Record History. All registered pharmacists and pharmacy technicians currently undergo a Criminal Record Check by the Criminal Records Review Program as required under Section 20(3) of the Health Professions Act. However, this check does not provide same level of comprehensive Criminal Record History that is required to be provided under the Pharmacy Operations and Drug Scheduling Act. It also does not allow for Criminal Record History of non-registrants to be provided to the College. As a result, the College cannot use the same criminal record check under the Criminal Records Review Program for the pharmacy licensing process since it does not meet the Criminal Record History requirements included in the Act. The College will be using a vendor that will meet the new requirements while supporting a timely and efficient process for obtaining a Criminal Record History. Registrants will continue to undergo a Criminal Record Check by the Criminal Records Review Program as part of registering or renewing their registration as required under Section 20(3) of the Health Professions Act. Direct owners, indirect owners, and managers of a pharmacy who are registered as pharmacists with the College will continue to have a Criminal Record Check completed every 5 years as part of their pharmacist registration renewal process (required under HPA). They will need also need to provide a separate Criminal Record History every 5 years as part of the pharmacy licensing process (required under PODSA). 5 years from the date that the information was last provided under this section. A direct owner, indirect owner(s) and a manager must submit a criminal record history pursuant to section 5.1 of the Act, in the form approved by the board from time to time. Direct and indirect pharmacy owners and managers will be required to meet the new eligibility requirements. The changes also mean that the direct owner of the pharmacy must apply for a new pharmacy licence or pharmacy licence renewal. A transition process will be established to bring all pharmacies into compliance with the new requirements through the annual pharmacy licence renewal. Starting April 1, 2018, all new pharmacy licence applications must must meet the new pharmacy ownership requirements in Pharmacy Operations and Drug Scheduling Act and College bylaws. The Type of Pharmacy Ownership,will determine what information is required for a New Pharmacy Application. All pharmacy owners (direct and indirect) will need to be identified and will need to provide a Criminal Record History to determine their suitability for pharmacy ownership based on the eligibility criteria. All managers will also need to provide their Criminal Record History. To learn how to apply for New Pharmacy Licence under the Act, determine your pharmacy’s ownership type then review the bylaws and use the New Pharmacy Applications flow chart to determine what information is required. 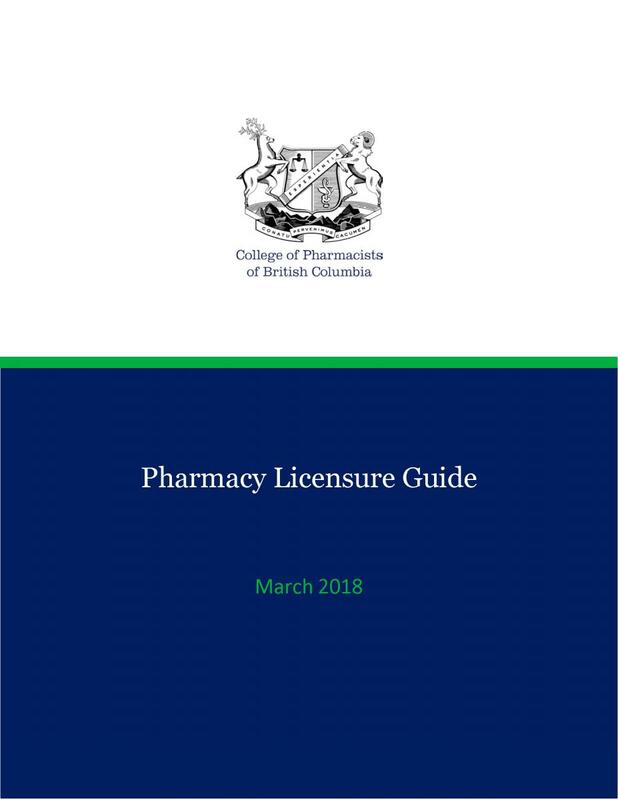 (1) Applicants for a new community pharmacy licence must submit an application consistent with the type of ownership under section 5(2) of the Act. a copy of the pharmacy’s current business licence issued by the jurisdiction, if applicable. a certified true copy of the Central Securities Register for a parent corporation if a direct owner is a subsidiary corporation. a certified true copy of the Central Securities Register. (1) Applicants for a new hospital pharmacy licence must submit an application consistent with the type of ownership under section 5(2) of the Act. a diagram professionally drawn to a scale of ¼ inch equals 1 foot, including the measurements and entrances of the pharmacy, confirming compliance with Schedule “D”. (3) The manager must submit an attestation in Form 5 and a criminal record history in accordance with section 14. (4) A pharmacy located in a hospital which dispenses drugs to staff, out-patients or the public and which is not owned or operated by a health authority, must be licenced as a community pharmacy. 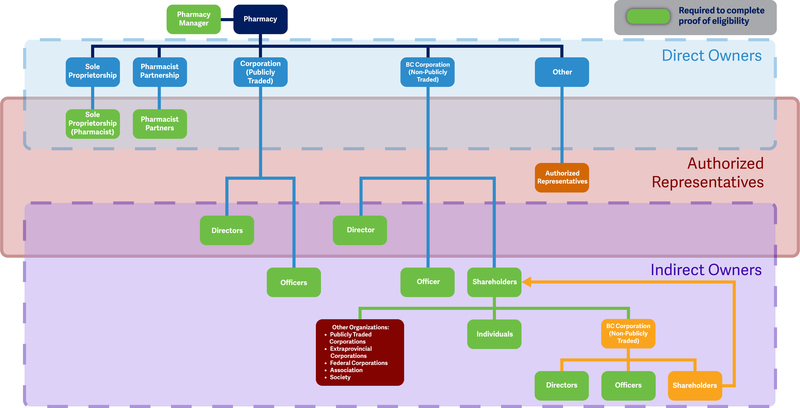 Information flow chart for New Pharmacy Applications (Hospital) coming soon. The new pharmacy ownership requirements move the responsibility of renewing a pharmacy licence from the manager to the direct owner. A transition process has been established from April 1, 2018 to May 31, 2019 to bring all pharmacies into compliance with the new requirements through the annual pharmacy licence renewal. Managers together with direct and indirect pharmacy owners are required to meet the new eligibility requirements in the Pharmacy Operations and Drug Scheduling Act and College bylaws. The College recognizes that additional work will be needed during this transition period renewal, and we thank you for your patience and understanding in implementing in these new pharmacy ownership requirements. To learn what’s needed as part of a pharmacy licence renewal under the new pharmacy ownership requirements, see the Pharmacy Licence Renewal flow chart below and review the bylaws. For this reason, pharmacy renewals between April 1, 2018 to May 31, 2019 part of a transition process designed to bring all pharmacies into compliance with the new requirements. The transition renewal, which is only required once, resembles the more detailed process for new pharmacy applications. To learn what’s required for a Pharmacy Licence Renewal during the transition period, determine your pharmacy’s ownership type then review the bylaws and use the Pharmacy Licence Renewals flow chart to determine what information is required. 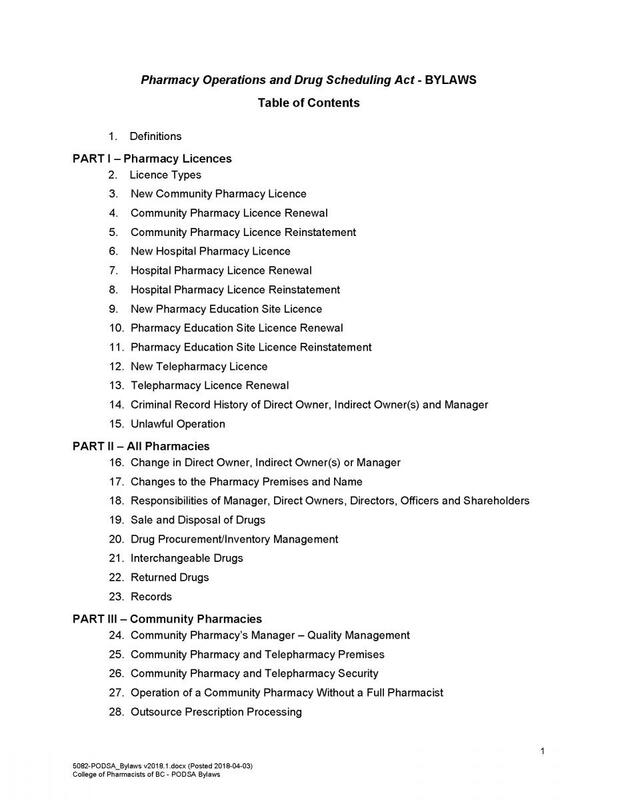 4.1 The first application to renew an existing licence, submitted after the Pharmacy Operations and Drug Scheduling Amendment Act 2016 comes into force, is an application for a new community pharmacy licence under section 3 but the requirements in subsections 3(2)(c),(d) and (e) do not apply. 7.1 The first application to renew an existing hospital licence, submitted after the Pharmacy Operations and Drug Scheduling Amendment Act 2016 comes into force, is an application for a new hospital pharmacy licence under section 6 but the requirement in subsection 6(2)(c) does not apply. Following the transition period, the process for pharmacy licence renewals will be streamlined. Starting in June 2019 direct owners, indirect owners and managers will only be required to review and update pharmacy ownership information and attest to meeting the eligibility requirements. To learn what’s required for a Pharmacy Licence Renewal after the transition period, determine your pharmacy’s ownership type then review the bylaws and use the Pharmacy Licence Renewals flow chart to determine what information is required. a copy of the current British Columbia Company Summary, if a direct owner is or includes a corporation. (3) An application submitted later than 30 days prior to the expiry of the pharmacy licence is subject to the fee(s) specified in Schedule “A”. the fee(s) specified in Schedule “A”. (2) At the time of the renewal application, the manager must submit an attestation in Form 5. Information flow chart for Pharmacy Renewal Process (Hospital and Education Sites) coming soon. Questions about the new pharmacy ownership requirements? Contact licensure@bcpharmacists.org.